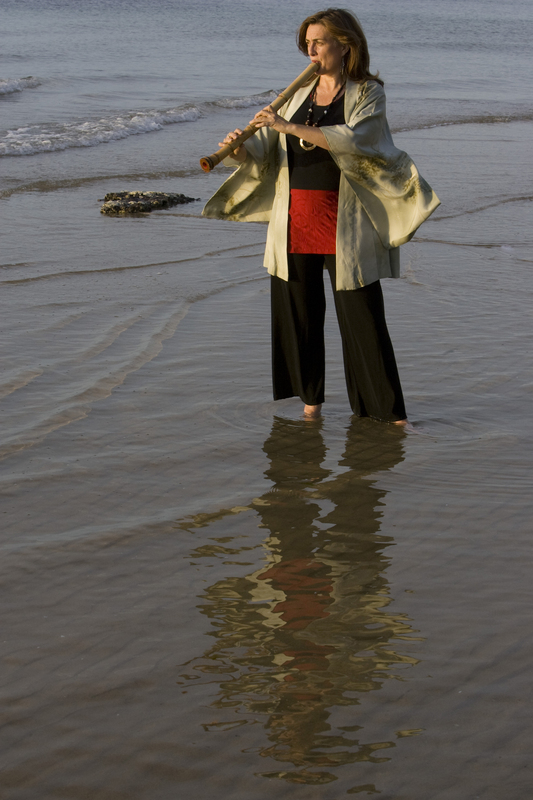 ANNE NORMAN is a shakuhachi performer, improviser and composer, working in a diverse range of music creation. An intuitive performer, Anne enjoys spontaneous improvisation with musicians, dancers, actors, poets, visual artists, installation artists and tea masters. Originally trained on flute, Anne took up shakuhachi in Kobe under Nakamura Shindo in 1986. In 1990 she received a two year grant from the Japanese Government to further her studies of shakuhachi performance at the Tokyo University of Fine Art and Music under Yamaguchi Goro, also studying a third lineage under Tajima Tadashi in Osaka. Anne has a Masters in Ethnomusicology (Monash Univ) and a Bachelor of Music (Melb Univ). In addition to her performance schedule, she tours to schools throughout Australia with taiko drummer Toshinori Sakamoto, presenting an interactive Japanese Music program. In 2009, Anne authored the book Curiosi-tea, since creating several tea-based theatre shows including her Nonchalant Bombasi-tea with Tea Master Adam Wojcinski (Ueda Soko Ryu) and her AFTERNOON absurdiTEA with Camellia Cha, featuring musicians from Tibet, India and China for the OzAsia Festival in Adelaide. In 2014 she will be part of a TEAm leading a tea & music adventure into the wilds of Yunnan, China.